Say what you wish about Christy Clark's "integrity", but her desperate moves to either retain power or trigger an election were motivated by larger concerns. Since 2005, the BC Liberals have enjoyed a fractured vote on the left. 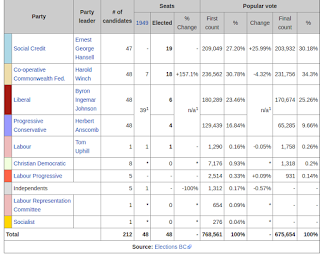 2001 was their only election win where their support exceeded 50% of the popular vote. Since then, both Campbell and later Clark learned the dark arts of playing one progressive party against the other. Yes, the BC Liberals got just over 40% of the vote and 43 seats (one short of a technical 'majority'), but the combined NDP/Green vote was over 57%. Its true that not all Greens would vote NDP if pushed. But a far larger would go orange than BC Liberal. And this exposes a problem for the BC Liberals. The lesson of which takes us back to 1952 where the established right-of-centre parties were trying to keep the growing CCF from winning an election.